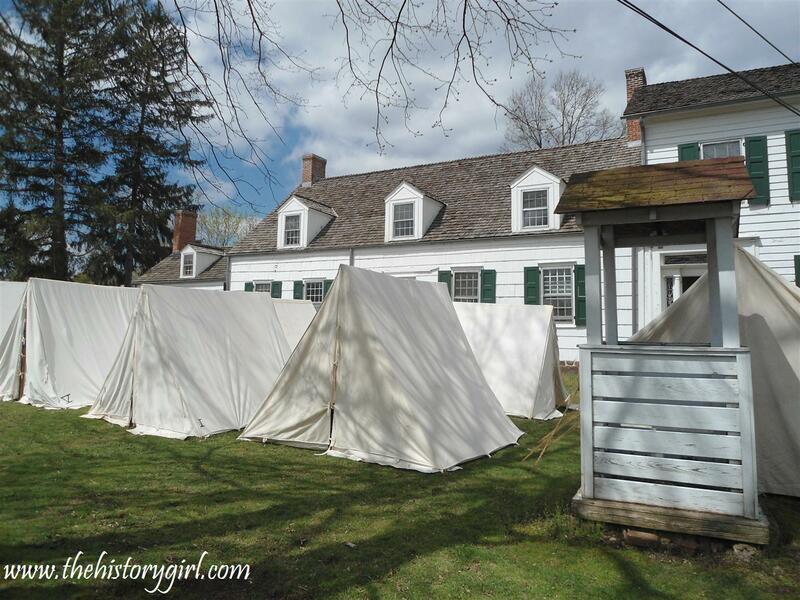 Living History Weekend at the Abraham Staats House in South Bound Brook - April 8 - 9, 2017 ~ The History Girl! Join us for an exciting and historic weekend, April 8 & 9, 2017, as we commemorate the 240th anniversary of the Battle of Bound Brook. 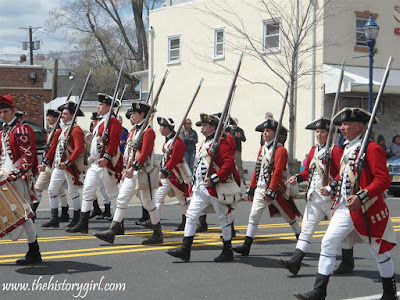 The two-day program, taking place in Bound Brook and South Bound Brook, explores the American Revolutionary War during the time-frame of the Battle of Bound Brook and the foraging wars of 1777. Learn about and experience this important period in New Jersey and America's history. 10:30 am: First street battle reenactment at the Old Stone Arch Bridge in Bound Brook (near the Queens Bridge). Followed by a ceremony at the Old Presbyterian Graveyard at the Bound Brook Memorial Library and BBQ Picnic Lunch with the Soldiers at Hamilton Street, Bound Brook. (11:45 am – 1:00 pm). * 2:30 pm: All Soldiers return to the grounds of the Abraham Staats House 18th century soldiers’ encampment. Abraham Staats House open for tours. * 5:00 pm: House and Grounds closed to public. * 4:00 - 7:00 pm Pasta Dinner, Reformed Church Fellowship Hall 113 Clinton St., South Bound Brook. Free to registered reenactors and open to the public: Adults: $10 / Seniors: $9 / age 5-10: $6 / age 4 and under free. Call Rev. Martin Winters at 732-322-1899 or e-mail martin_winters@hotmail.com for information. 7:30 am - 12:00 noon: Breakfast Buffet, SBB Fire Co. #1, Edgewood Terrace, South Bound Brook. Free to registered reenactors and open to the public: Adults: $9 / Seniors: $8 / under age 10: $6 / under age 5 free. * 2:30 - 3:30 pm: Battle on the Grounds: Watch the American and British soldiers as they drill and perform military maneuvers of the American Revolution. 4:00 pm - House and Grounds closed. The Abraham Staats House is located at, 17 von Steuben Lane, South Bound Brook, NJ. Grounds are Free: 18th-century soldiers' encampment on the grounds of the Abraham Staats House. Come walk through camp and see what life was like for American and British troops during the time of the American Revolution. Experience Soldiers Drills, 18th c. sutlers (merchants), period music, special activities focused on the Colonial Era. Historic House Tours: The Abraham Staats House, with the original structure c. 1740, was home to the Dutch Staats family for nearly 200 years and served as the headquarters for George Washington's "Drillmaster" General Baron von Steuben. Historic House Tours Weekend Pass includes tours, Sunday lectures, and special presentations. Adults $10; Seniors and ages 18 and under $5; Family pass (up to 5 members) $20. Passes available at the Main Tent and online at www.staatshouse.org. Visit www.staatshouse.org for Battle of Bound Brook schedules, information and updates. Friday, April 7: 7:00 pm Betsy Ross at the Brook Arts Center, 10 Hamilton Street, Bound Brook. For more information, e-mail info@brookarts.org or call 732-469-7700. 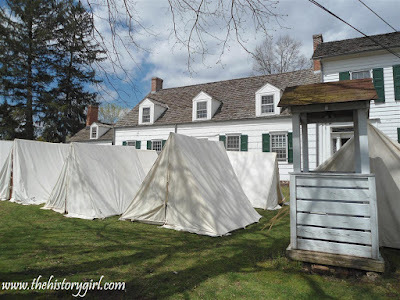 Saturday, April 8: Join the Heritage Trail Association for our annual “Breakfast before the Battle” at the Van Horne House, 941 East Main Street, Bridgewater, NJ. $10 per person for waffle bar, fruit, juice, and more. Register at www.heritagetrail.org. Saturday, April 8: Special Exhibits at the Bound Brook Memorial Library. Open to the public Monday - Thursday 9:30 am - 9:00 pm, Friday and Saturday 9:30 am - 5:00 pm. Saturday, April 8: 7:00 pm Spring Ball and Social at Van Horne House, 941 E. Main Street, Bridgewater, NJ. Live Period music by Ridley and Ann Enslow. $15 per person. To reserve contact janice.wolk@yahoo.com. The Friends of the Abraham Staats House, Inc. is a 501(c)(3) non-profit organization which has received an operating support grant from the New Jersey Historical Commission, a division of the Department of State though the State/County History Partnership Program Grant, and administered in Somerset County by the Somerset County Cultural & Heritage Commission. During the American Revolution, the house was owned by American patriot Abraham Staats, marked as an enemy of the Crown by the British. His family hosted General Baron Frederich von Steuben, drillmaster of the American Revolutionary Army, who used the house as headquarters during the Middlebrook Cantonment, when the American army was quartered in the area during the winter of 1778-79. Research indicates the earliest portion of the house dates from around 1740, with later additions including a wing built c. 1830 by the Staats family, which owned the home for nearly 200 years. Following the Battle of Bound Brook in April 1777, a retreating British column crossed the Staats’ property, taking items which Abraham later made claim as war damages. The home was the setting for visits by General George Washington and other key figures during the War. The Borough of South Bound Brook purchased the Abraham Staats House in 1999 for historic preservation. The South Bound Brook Historic Preservation Advisory Commission and Friends of Abraham Staats House, Inc. are dedicated to preservation of the house, which has been placed on both the State and National Register of Historic Places. This triple-arch bridge is one of the oldest surviving stone bridges in New Jersey and a rare example of colonial highway engineering. Construction of the bridge was authorized by the Legislature in 1730. 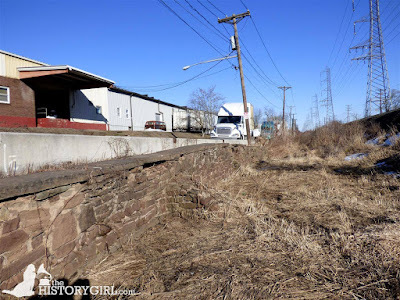 It was probably built soon thereafter to span the Green Brook, a channel of the Bound Brook, and form part of a causeway that crossed a large area of marshy ground along the Bound Brook and Raritan River. The bridge played a significant role in the defense of Bound Brook during the Revolutionary War, and it is one of the few existing battlefield resources in New Jersey for which a first-hand action account exists. The diary of Hessian officer Johann von Ewald records the fighting along the causeway during the Battle of Bound Brook in April 1777. Made of locally quarried rough sandstone and shale, the bridge spans the boundary between Somerset and Middlesex counties and the boroughs of Bound Brook and Middlesex. Approximately 85 feet long and 33 feet wide, its remains are almost completely buried by fill on its north side; on the south side they are exposed above the top of the arches, including two large buttresses, one of which is relatively intact.